We recently upgraded the Brewster Voicemail server and along with the upgrade came the new functionality of being able to receive BA voicemail audio messages in your email inbox. 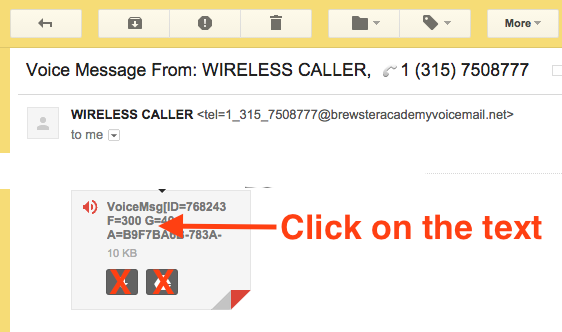 When you receive a voice message on your BA phone, you will now see an email message in your inbox. Click to open the message to see an icon representing the voice message. …and the message should start to play automatically. Once you listen to the voice message the message-light should go off on your phone. If you delete the email message, you will not have to delete the message from your phone. If you delete a voice message from your phone, the email message will magically disappear from your inbox.